Apply oil or acrylic paint straight from the tube with a Colour Shaper, and then use it to carve back into the paint for a variety of texture and surface effects. The tool easily lifts paint from the surface or draws lines, contours, and edges on the color. With seamless nickel ferrules and lacquered hardwood handles, they offer the quality needed by dedicated artists. To clean, simply dip the tips in water or solvent and wipe with a cloth. Don't worry — dried color just peels away! Available in Soft or Firm tips. The ivory-colored tip is soft and designed for responsiveness with fluid and soft colors. The gray tip is firm and offers better control over heavy bodied paints. Choose your size, shape, and firmness, or try a sampler set of 5. Mini Sets of 5 — Just like their larger counterparts but these are only 1/8" wide, size 0. 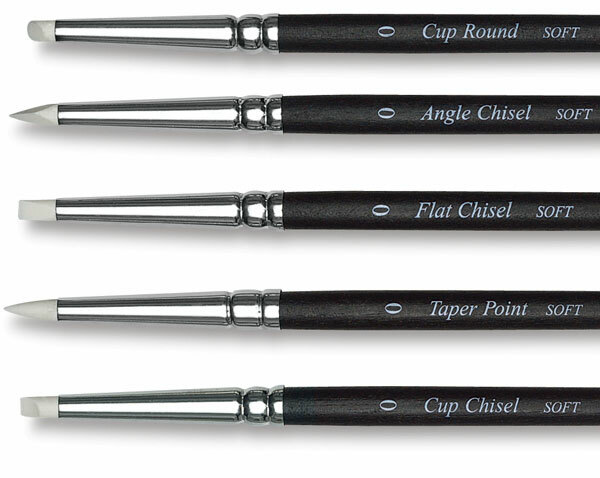 Sets of 5 — One of each tip, including Taper Point, Cup Round, Cup Chisel, Flat Chisel, and Angle Chisel. Available in Firm or Soft. Colour Shapers are a sensible alternative to painting knives when working impasto. Use them also to build brushstroke-free glaze layers. Colour Shapers create unusual gestural effects in watercolor and hard-edged calligraphic strokes with ink. 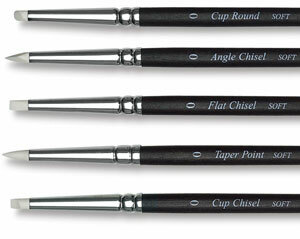 Try them for blending, smudging, and dabbing your pastel paintings and charcoal drawings too.